Malaysian culture has grown from a potpourri of ethnic mixes derived from some of the world’s oldest civilizations. Malaysia is a lush tropical land full of natural resources that add flavour and variety to research,cultivation and processing of foods. Thus, Malaysia is poised to become one of the leading Asian countries in food production and processing. ・In this topic, the materials such as Livestock and diary, Fisheries, Cereal Products / Flour Based Products, Chocolate and Sugar Confectionaries, Pepper and pepper products, Fruits and Vegetables, Palm Oil-based Products are listed in details. 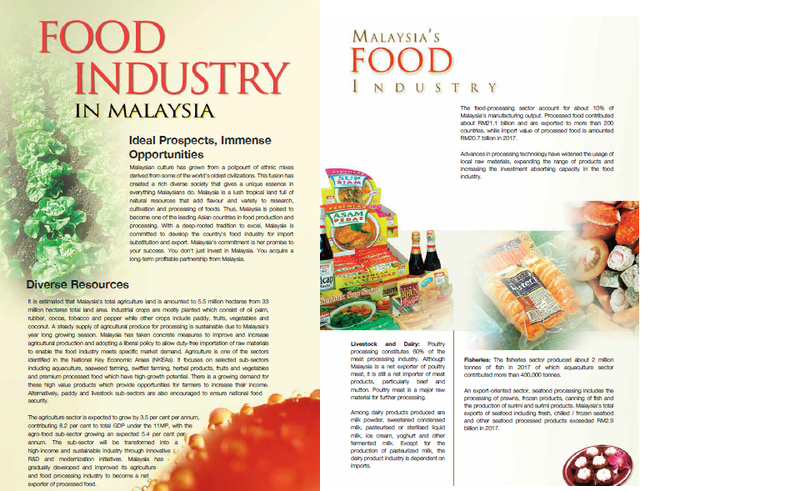 ・In this topic, the Halal industry is written in details which is important for Malaysia in food industry. ・In this topic, Ministry of Agriculture nad Agro-Based Industry(MOA), Malaysian Investment Development Authority(MIDA), Halal Industry Development Corporation(HDC) are listed in details for the Incentives. ・Investment opportunities abound in the food processing sector. The three thrust areas are Health Food/Functional Food, Convenience Food, and Food Ingredents. These are listed in details.